Each group of 4 cubes creates a very strong composition in the center of the assembly. Which allows the pin to go through and lock the cubes together. T Docks are as easy to put together as 1-2-3. Put your dock together yourself or have it installed by one of our team members. “T Dock” is committed developing High Density Polyethylene products of superior design, performance and value. We pride ourselves on developing an ongoing, lifelong relationship with you, our consumer and T-Dock association. Due to our extreme confidence in our products and our insatiable desire to deliver only the highest level of service. “T Dock” is committed to delivering high quality products, and we stand behind this commitment with our 5 year Warranty. Made out of high density polyethylene, our floating docks has been tested under high pressures and temperatures to ensure reliability and environmental climatic hazards that may occur over time. Designed for watercraft like row boats and canoes. Over the years, the low dock have been used in several international competitive rowing events. 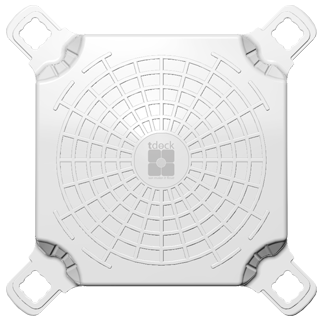 Order your low dock today or just add the lower cubes to your original T Dock installation for an easier access side as demonstrated on the illustration figure. Perfect for an easier access to water in general, as well as for smaller children and schooling purposes.